In 1916 Maude Hunter established the first commercial store at the intersection of Shelbourne and Cedar Hill Cross Road. Many Victorians walking up Shelbourne St. would stop at the little store to warm themselves in front of the wood stove, have a chat with Maude and other neighbors before venturing on their way. These were the days when the corner store was a local gathering place, where you could post a letter, pick an apple out of the barrel, buy candies or groceries, and 5 cent spending money went a long way. In 1921 the first electric street light north of the Victoria boundary was installed at Shelbourne and Cedar Hill Cross Rd. When it was known as “Hunter’s Corner”. Young people congregated outside under this street light on summer weekends. In 1923 Maude’s father, Captain Hunter and her brother George, added a tea room to the store which housed 2 or 3 little tables. Maude is remembered as a generous and considerate person, and ran her store and tea room until 1929, when she left the community and moved to Toronto. 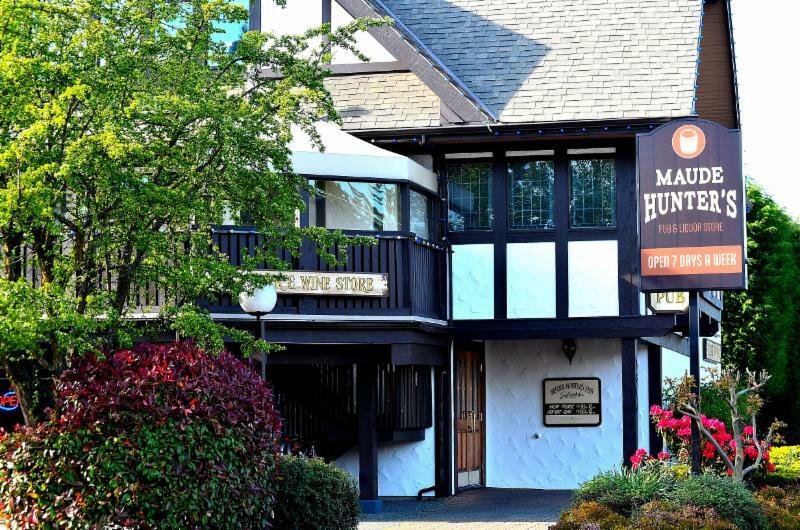 In 1986 Maude Hunter’s Neighbourhood Pub was established as the second neighbourhood pub in Victoria, the first being Spinnakers. In 2016 Maude Hunter’s proudly celebrated its 30th anniversary. Maude Hunter’s Neighbourhood Pub is dedicated to the spirit of warmth, congeniality and hospitality represented so well by the original tiny store at the cross roads.